UPDATE: As of 2017 I do not believe this is currently available. The links will lead you to the page where you can search for similar products or you can research this one instead from Ozark Trail. From their own product description: Compact, durable, easy-to-clean silicone pour-over coffee drip brewer holds your paper cone filter and delivers a delicious, home-brewed cup of coffee, on the go. Simply fill the Sili-Dripper with your favorite coffee grinds using a #2 paper coffee filter, place it on top of your coffee mug and pour boiling water over the grinds. Brews coffee as you pour slowly over the grinds, let it drip for a minute or two after to get full coffee flavor extraction. FDA & NSF approved food-grade silicone is BPA free, lead-free and heat resistant to 500°F making it dishwasher safe and it will not stain or absorb odor. Brew at home, in the office, camping, RVing, etc. Carabiner included for easy of carrying/drying. Collapsible cone saves space for drawer or backpack storage makes it easy to bring camping, or store at the office. One simple, durable part is easily cleaned in the sink and is dishwasher safe. Brew delicious, home-made, drip brew coffee without expensive equipment. Easily use this single cup coffee maker while sitting beside the campfire. Carabiner included to make it easy to attach to your backpack or belt loop. UPDATED: As of spring 2017 there is only 1 if these left available from this seller. However, the links still lead to the collapsible java drip and you can search for similar products if this one is sold out. I'm pretty excited about the next two posts I'm working on - it's not only about coffee (of course) but also my other favorite topics, emergency preparedness, backpacking and camping. I've spent the last two days doing a lot of research online at Amazon (I'll link to it) as well as competitors, for a few items I wanted to get and while doing research for all these items, saw these again and decided to do a post for 2 different collapsible coffee brewers. I get really excited about camping and emergency kit items, so I'll try to tone down my enthusiasm! First, is the GSI version. Now, I've posted a couple times about my love of the GSI Outdoors Java Press I bought last year for my emergency kit but loved it so much I still use it about twice a week. However, it's pretty big and if space is an issue (think; backpack or bug out bag) but you love your coffee and it's important to you to include a way to make it; then think 'collapsible'. This is the GSI Outdoors 79480 Collapsible Java Drip Coffee Maker - which I actually mentioned almost 2 years ago (August, 2013) but it's still one of the best options so it's worth repeating before I go on to my next choice. This is a collapsible drip cone that holds a #4 filter to brew 1 - 12 cups of coffee, depending on the amount of grounds you use. The sturdy, silicone bellows design collapses to a 1" high, 5.6" diameter disc. The flanged design helps center the drip cone over mugs, cups and wide-mouth bottles for stable, spill-free brewing. The lid can double as a trivet after brewing. From the GSI site product description: Don't settle for instant, when you're on the trail or in camp. Pack a GSI Outdoors Collapsible Java Drip on your next outing, and enjoy freshly brewed coffee, just as you would at home. Folds flat, weighs next to nothing, for easy packing. Dimensions: 5.60" x 5.50" x 1.00"
If you've been looking at pour-over style coffee makers for traveling you may have seen the Melitta coffee cone - which I like, but unfortunately it does not collapse or pack down so it takes up too much space. This version is small enough to toss into your suitcase for traveling or in your backpack if you can afford a 1" X 5 1/2" space-taker. As I mentioned in my post in 2013 regarding this particular cone, some people have complained it has a bit of a chemical smell when you first open it, as it's made from silicone. This goes away after you wash it with dish soap. Average cost across all the sites I checked today showed this coffee drip brewer to be about $12.95. Although I've featured coffee art in the past - it's been a long time! This week I was looking at some of the newer artists painting with shades of coffee (instead of water colors) and I thought I'd add a couple to Coffee Talking since I hadn't in a while! 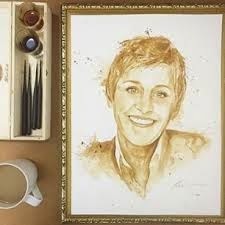 Ellen Degeneres in Coffee... who wouldn't love that? Unless Ellen doesn't like coffee... but I think she does. 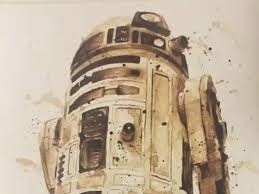 And then their is R2D2 for you Star Wars fans... yes - ALL IN COFFEE! How awesome, right? 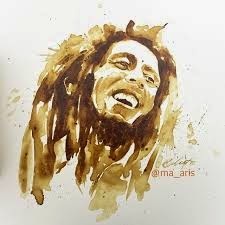 And Bob Marley... the talent is wonderful, even without the 'painted in coffee' factored in. So, who did these?? The 3 works above, are done by a very talented young lady named Maria - (I'll link to her below). But I also found another who has a couple videos on youtube and I watched how effortlessly she whipped out a great rendition of Audrey Hepburn. There are a LOT of artists out there who dabble in coffee. There are so many wonderful and amazing works of art! I chose these two randomly as I liked the Ellen print and the Audrey prints. 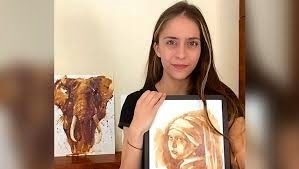 If you have an interest, just do a search for coffee painting or similar words and you'll be amazed at what's out there! She makes it look so effortless!! Always sipping my coffee and reading the news; I found this story numerous places on the net even though the product is not available yet. Although I don't drink my coffee with milk or sugar, nor do I like most flavored versions; I think the idea is a good one and I hope to see it come to market. 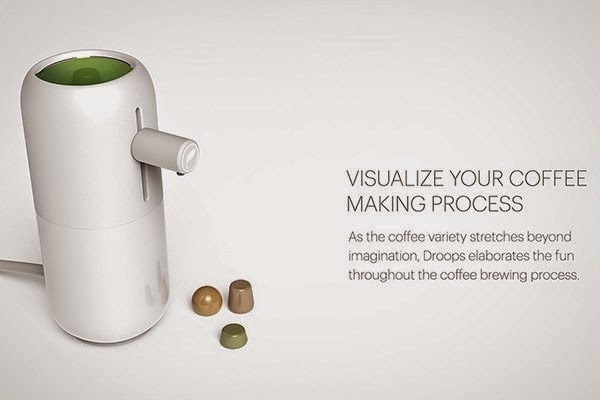 Eamon Chow Wai Tung hoping to have a hit with his Droops Coffeemaker, the first system with edible pods. Each one would have coffee grounds in the center, a layer of solidified milk around them and then an outer casing of sugar. All three layers would dissolve in hot water for a cup of coffee as easy to brew as a K-Cup with none of the waste. The soaring popularity of home coffee machines has led to a increasing amount of waste generated by the pods. Now, inventor Eason Chow believes his new product could be the solution - and found inspiration from the sugar-coated sweets dispensed from gumball machines. Pods are made of coffee granules in milk powder are then dipped in sugar." Mr Chow says the sugar coating will come in varying thickness and flavourings to suit all tastes - and he has also made a stackable coffee maker to use the capsules with. 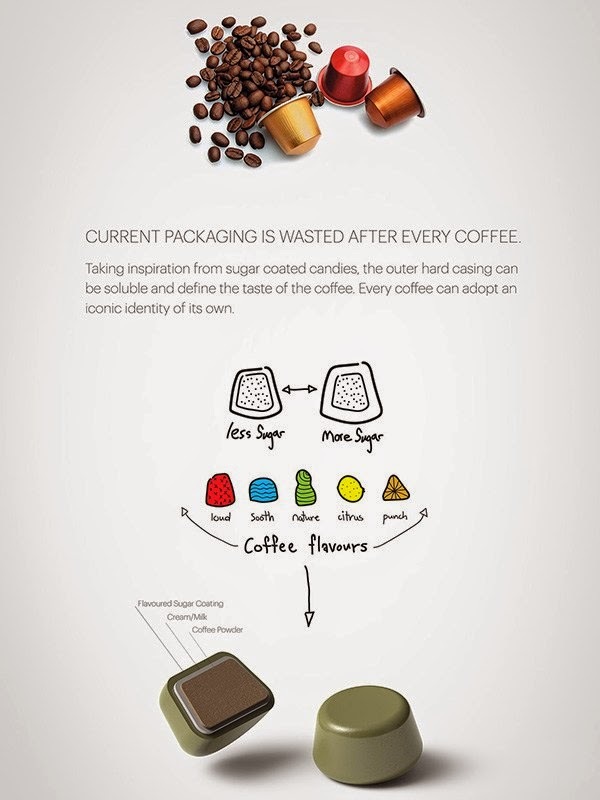 He came up with the idea after realising how much waste packaging is generated from coffee capsules each year. The product, called Droops, is still in the early stages. Mr Chows says he wanted to incorporate an element of surprise and fun in the design. He explained he drew 'memories to my childhood' and 'the surprising and fun element of dispensing sweets from a gumball machine'. 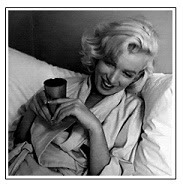 He added that most coffee machines on the market are very industrialized and made to process coffee out of convenience. 'They neglect the importance of the visualizing and the social responsibility through its usage,' he said. While online looking for some fun ideas to do with my soap-making projects this week, I stumbled upon this homemade lip balm with coffee butter and cocoa butter - which together, smell like a yummy vanilla latte. I make my own homemade soaps, salves and balms - and it really is quite fun and easy if you have an interest at all in them. This is not my personal recipe, but the source is noted. I thought since this blog is all coffee related, a coffee lip balm would fit right in! In a small heat-safe container, use a microwave to melt the Cocoa Butter. It helps to break it down to the smallest chunks possible before heating it or you can mix it with the Avocado Oil to help the butter melt down smoothly. Cocoa butter has a higher melting point that other solid oils, so be sure your heat-safe container is able to withstand prolonged temperatures and if it’s glass, remove it from the microwave with a pot holder. Add the Coffee Butter to the Cocoa Butter and stir until the Coffee Butter is completely melted and the mixture is no longer cloudy (you may have to zap it in the microwave for a few more seconds). Add the Avocado Oil and mix well (if you didn’t already during the Cocoa Butter melting phase). Line up the Classy Lip Pots (sans lids) and pour the mixture into the containers. Allow mixture to harden. Twist on the lids and enjoy! This recipe does not make use of any flavor oils, so what you’ll taste is just the natural flavor of the Coffee Butter and Cocoa Butter. As-is, the flavor is much like a great cup of black coffee. But if you usually take your coffee with sugar, try adding a bit of Stevia to the recipe. Prefer cream? Why not try Vanilla or Buttercreme (or Caramel or Coconut or…) flavors. As written, this lip balm recipe is on the softer side for ease in application with the finger from the lip butter pots. Adding 25% beeswax works well for giving the lip balm a bit harder texture if desired!